The airline was reformed from the remnants of short-lived Potomac Air, which was created in late 2000 and started flying 37-seat de Havilland Canada Dash 8-200 aircraft in early 2001, based at Ronald Reagan National Airport in Arlington County, Virginia near Washington DC. Potomac ceased operations during the closure of Reagan National after the September 11 terrorist attacks; US Airways then reformed Potomac as MidAtlantic in the spring of 2002. MidAtlantic officially launched on Sunday April 4, 2004 with service from Pittsburgh. Some CRJ flying was done by MidAtlantic as early as 2002 but those airplanes eventually went the US Airways Group subsidiary PSA Airlines. MidAtlantic did not actually have an operating certificate, but operated under that of its parent, US Airways. MidAtlantic was started as a "Jets for Jobs" experiment, hiring furloughed mainline pilots to fly the new aircraft. However, the company ceased operations May 28, 2006, having sold most of its assets to Republic Airlines during US Airways latest bankruptcy. 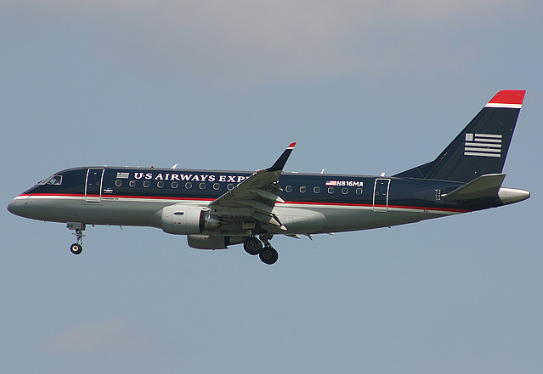 Republic continued to operate the craft under the US Airways Express banner.